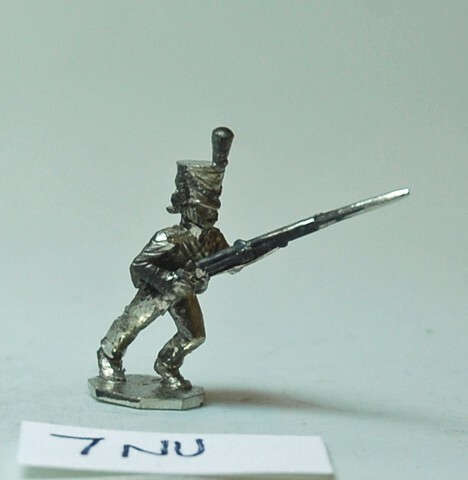 Please can anyone help me with the identification on the shako worn by this 15mm Minifigs figure? It looks like a french infantry shako. Thanks for your comments. That would be the beginning of the war FELT shako. This was the shako worn by USA officers assigned to organize militia units at frontier settlements. It is why the officers at Fort Mims are shown wearing the felt shako. The post war belltop shAKO WAS MORE FLARED. tHE LATER WAR WAS A COPY OF THE bELGIC SHAKO. It was made of leather and called the Leather shako. It is certainly not an American 'Tombstone shako' for the period mid 1813 to 1815. It somewhat resembles an American early war yeoman shako, however, this figure appears to have flounders on the side of the shako instead of tassels (hard to tell re lack of contrast), a French indicator. Also, check the shako cords, if they fall in front of the shako like u shape then it is unlikely American. Instead, American shako cords went from the top left to the bottom right (as you are looking at the shako front). So it appears that this is a French infantryman. I've seen this before on early War of 1812 US. Can't speak to the historicity, but I expect that's what it was intended to represent. Note that a number of the fancier militia units would have worn something similar, and given US logistics, there's no telling when the last ones were pulled from service. Perhaps it is still meant to be an American shako but the sculpt is simply incorrect? PS The 1813-1814 leather shako and the tombstone shako are the same shako. Early shako…1812 to spring 1813…later, with some units, when the barentino model (in leather) spread up. Look at US drill manuals like Duane's translation of the french, and you'll see this in the plates. I believe this figure is the Minifig's US Marine. -A Most Warlike Appearance: Uniforms, Flags, and Equipment of the United States in the War of 1812, published in 2011. -A Scarlet Coat: Uniforms, Flags and Equipment of the British in the War of 1812, published in 2011. Both are heavily illustrated and have some color paintings included, some by Partice Courcelle in the US volume. The prints produced by The Company of Military Historians are also valuable resources and can help with uniform questions.